The game of poker is full of successes, bad beats, and flat out stupid plays. In some sort of contorted and twisted justification, many poker players will call bets while on huge draws and go all in with no less than top pair, many times with a mediocre kicker. Poker players that play using this style of “hyper-aggression” generally do not have any idea of expected value, much less what it means in terms of being a winning player or losing player. Whether you are are Texas Hold’em, Pot Limit Omaha, 7 Card Stud, Omaha Hi Lo, or Razz player, knowing the Expected Value is a very important concept for poker players. For those of you that are unfamiliar with expected value or EV for short, it is a positive or negative outcome of a play or strategy if used consistently over the long haul. Since poker is a life long session, this is a very important concept to understand and use while you are playing poker. For example, if you were the type of player who played any suited card and with 2 cards of the same suit on the flop you would chase that draw to the river, that play would more than likely have a negative expected value. While you may win occasionally, if you were to look at the numbers over a long period, the statistics would simply show that you would lose more money than you would gain. To put this into better perspective, let’s look at an example using actual numbers. For this example let’s say you are on the button with Ace-Jack of clubs and the blinds are now $50-$100. Everyone folds to you, you decide to limp in for $100, the small blind folds and the big blind checks his option. There is now $250 in the pot. You both see the flop which is 4h-5c-10c. This flop completely missed you but you have a draw to the nut flush. The big blind acts first and leads out for $125 making the total in the pot $375 and $125 for you to call. Should you make the call here? Disregarding any read you may have on the player, let’s decide solely on the math alone. First, you need to figure out your outs. You have two clubs in your hand and there are 2 on the flop. So when you figure out your “outs,” you know that only 4 are missing out of a possible 13. So, you have 9 cards out of a 47 unseen cards that can still help you. This would give you odds of 47:9 or when simplified, 5.2:1. This tells you that approximately every 6 times you try the exact same hand you will lose a little over 5 times and win once. This is where expected value comes in. Sometimes you can make this call and in the long run, it is profitable while other times it will not be. How do you decide? Well, you know that your odds to complete your hand are 5.2:1. To call the bet it will cost you $125 with a return of $375 should you win. When put into odds it will look like $375:$125 or when simplified, 3:1. Now knowing your odds and pot odds, you can now compare them to see if calling here is profitable over time. What you will want to do is compare your odds: 5.2:1 vs. 3:1, and take the amount of times that you will lose (5.2 times) and multiply that by how much it costs to call. Example: Your equation would look like this: 5.2 * $125 = $650. Now, you will want to compare that with the amount that is in the pot for the one time that you will win: $-650 vs. $375. For every $650 that you lose, you will win $375. Or shown as expected value, you will have a net loss of $-275 which makes this call wrong and gives you negative expected value or -EV. What would make this call correct? 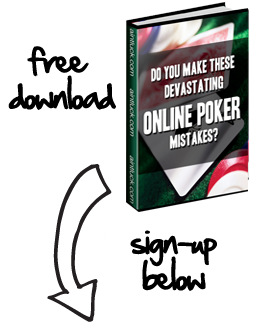 Well, to make things super easy so you do not have to bring out a pen and pad every time you are faced with this decision it is easier to remember that you want the odds to hit your hand better than the pot odds that you are receiving. So for example, this play would be profitable if your pot odds were 6:1 instead of 3:1. Assume that there is $725 in the pot and you only need to call $125 to win it. So if you take the 5.2 times that you will lose and multiple it by the $125 that it will take to call, you will lose $-650. However, the one time that you will win, you will win $725 which gives you a positive expected value of $75 ($725-$650 = $75). Now, expected value is only one of a few things to keep in mind when making a decision regarding your play. You will want to consider other factors such as reads on your opponents and where you may be in the tournament to make a more educated decision. It is also important to note that in our example of a positive expected value (+EV), that if you make the call there it is still possible to miss the flush and lose. Just remember that over time, the odds are in your favor of winning which is why it is expected value, and not guaranteed value. Content Provided by 4KingPoker.com - Poker Forum, Poker Strategy, Tips, and Reviews.